Uncategories Pump up the volume? 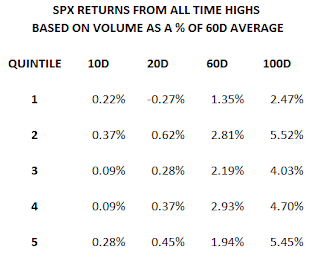 Another day, another all time high in the SPX. The quiet grind of the last month has really been quite astonishing; the freefall of the first seven weeks of the year (or the first seven months of the year, if you trade Eurozone bank stocks) seems like a long time ago. A number of observers have commented that there's rarely been a rally hated as much as this one, and that seems just about right. Long in the tooth, apparently dependent on the monetary largesse of global central banks, contrary to most sane reading of the fundamentals: pick your excuse for being skeptical. Certainly Macro Man has on occasion, and he feels generally pleased to have emerged fairly unscathed from his attempts to short the SPX. One of the criticisms currently applied to the latest summiting of equity market Everest has been the execrable volume that has accompanied it. This is proxied on the chart below of the SPY; note how far the volume is below its 60d moving average (let alone the figures from last August or the beginning of this year.) The implication is that the market has drifted higher because of the absence of sellers rather than any committed buyers. Once the former return to action from their summer holidays, the thinking goes, the market may be in for a spot of bother. This reasoning certainly seems to make sense, particularly given that the USS SPX has charted a course straight for the Scylla and Charybdis of Trump and Hillary in a few months' time. That being said, if volume at highs were really a reliable indicator, we should be able to observe it in the historical record. Macro Man designed a little study to do just that. Using every all time daily closing high since 1990, he calculated the daily volume as a percentage of the 60 day moving average. He then compared it with the subsequent price action over a variety of forward looking windows. All told, the study comprises 436 data points, though that drastically overstates the true number of independent observations, given that all time highs tend to cluster. 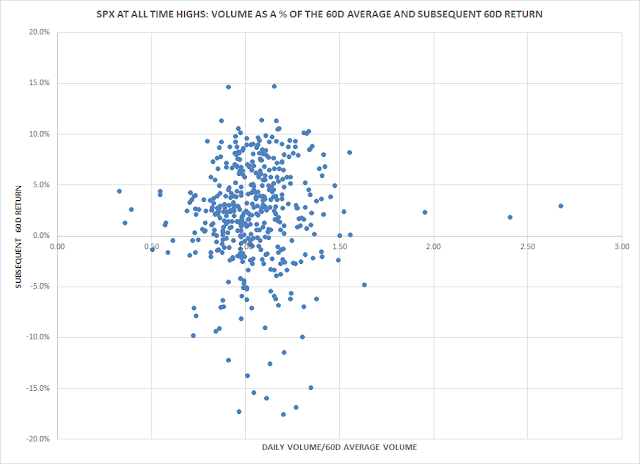 On the face of it, the data is a bit of a muddle; the chart below shows a scatter plot of volume as a percentage of the 60d average versus the subsequent 60d returns. With a correlation of 0.03, it's hard to claim that there's anything there. What if we segregate the volume data into buckets? Macro Man split the numbers into quintiles to see if anything notable emerged from the data. The answer is "kind of". On meaningful time frames of a month or longer, the top four quintiles are largely indistinguishable. All time highs tend to beget further gains, which isn't particularly surprising given the clustering effect mentioned above. We can say, however, that outside of short run considerations the performance of the bottom volume quintile does appear to be notably less positive than the rest of the cohort. In case you were wondering, over the sample period volume at all time highs does tend to be slightly higher than average, by about 4%. 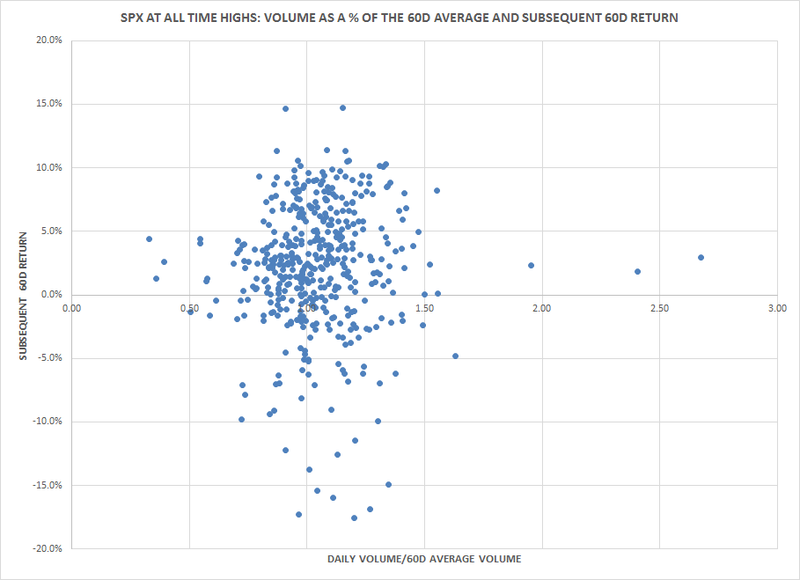 The cut-off for the bottom quintile is volume at 88% of the 60 day average. 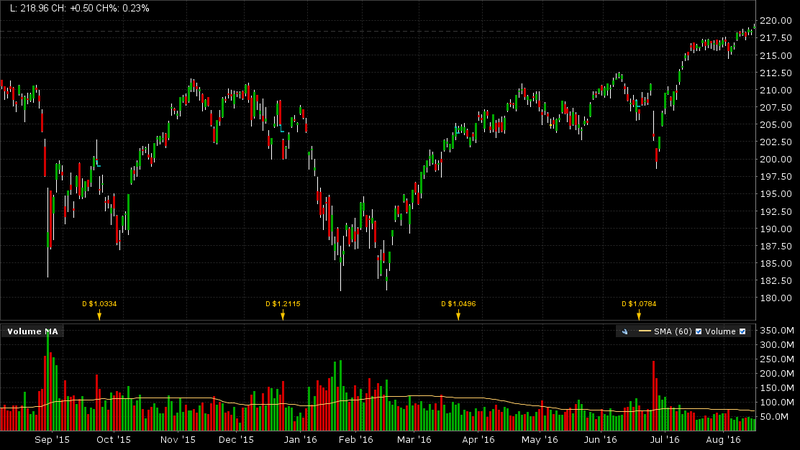 To put that in perspective, volume over the last several days has been roughly 75% of the 60d average. 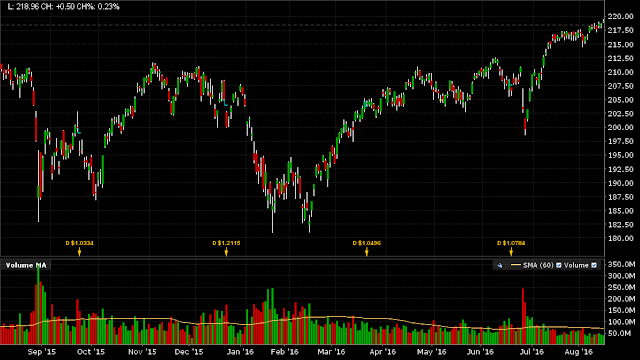 Is this conclusive evidence that the market is fixin' to take a swan dive once the adults come back into the pool? 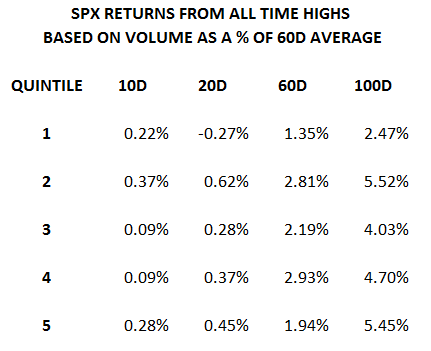 Clearly not...after all, over most time frames the subsequent performance of even low volumes has tended to be higher. Moreover, whatever you may think of equities as a value proposition, they still look comfortably more attractive than bonds in most jurisdictions. Ironically, you might even argue that an increase in volume would be the worst possible medium term outcome for stocks, as it would suggest that long term sceptics are finally being sucked in. Or maybe it's just as simple as staying long until the presidential candidates start haranguing each other properly on the television ahead of the elections. At that juncture, the most tempting option will be to turn down the volume (well, hit the mute button, actually) and get out of everything...including, if we are to believe one billboard that Macro Man saw in South Carolina, America itself. I made a tactical mistake on the Ftse . I started reloading my short 6750-6800. Fortunately, I realised the market strength before I became net short and removed it. There's something to be said for a lack of conviction at times if it allows you to be flexible. After expiry and closer to month end squaring looks a better time to be adopting a corrective position. When I thought about it I should have seen this month more clearly given the 3 to 4 billion remove for Brexit was obviously going to create a vacuum of size to fill and thin holiday volume is actually a good trading position to do just that. Saying that I have to take the view this has been a trading month and not one for investors to be concerned about. The 3 wave virtually parabolic move in long end gilts as far as I am concerned is a good reason to just bank what remains of that position. Whilst I also don't subscribe to euphoria in equities sharing your view I can't say the same for gilts. Indeed, looking around at the general market position the consensus I'd be concerned with is the widely held view that the Fed won't move anytime soon. Is virtually everybody going to right about this ? Moreover, the asset spread effect if they are wrong would be really nasty at this point if positioning and consensus actually mirror each other. Trading positions are much more likely to bank profit in the face of a surprise. What an amazing after the rally call. Where can I subscribe? Is it you who has that yacht moored in Marbella named ZEW? Yes, macro man, where cancelling summer trade holidays. Too risky that environment. Just looking around in volume. Seriously f..ked up system we now have gentlemen. Never have I seen anything remotely so screwed. At highs, you have this tendency to grind up and in those cases you dont need volume. PS - are you using excel to do most of your analysis? I started using R and its f-ing awesome. I highly recommend. Well at least NIRP will produce inflation for vault builders. Utility and REITs are falling, reversing the bullish trends. Is it a signal of the rising of bond yields? EM bonds and equities are rallying. If this is a rotation, I wonder where the money is going: traditional retailers and ag sectors? So, Jackson Hole will be about "Designing Resilient Monetary Policy Frameworks for the Future," Yellen will be speaking there, and Williams just put out a piece saying, in a low r-star world, central banks should consider a higher inflation target and/or nominal GDP targeting. If markets start anticipating that the Fed will adopt one/both of these approaches by/during the next recession, is there a trade today? Besides buying spooz (to pre-empt 12yo HFM). Re EM local bonds and LB's comments from last week, you may well be right. But for now I'm modestly positioned the other way with the "Tiny Punters" and other characters. There are many reasons why this trade may work, including: 1) since the late 70's, EM assets have outperformed following big depreciations, 2) after four years of poor returns, investors were underweight and may not have fully corrected that, 3) EM real rates look decent, especially versus DM, 4) the EM-DM growth differential has stopped narrowing and looks to be widening out, 5) current accounts have adjusted significantly, 6) Chinese PPI appears to have bottomed and has been rising since the beginning of the year (end of deflation?!). The timing may be off. It's already moved a lot, and seeing MBONOs finally joining the rally may be some contrary signal. Also, Rousseff's impeachment (or maybe the October municipal elections) may be the sell-the-news moment, when hope has to start being substantiated by policy-making fact in Brazil. And then there's China, where private sector debt-to-GDP is approaching levels (230%-ish) that has been a ceiling for other economies. Re China PPI, just to correct myself, the yoy PPI comparisons have been getting less negative, but not actually "rising." MM if this kind of daily volume study worked, us stat arb guys would have destroyed it already.